Building Research Establishment (BRE) is a centre of building science in the United Kingdom, owned by charitable organisation the BRE Trust. It is a former UK government national laboratory that was privatised in 1997. BRE provides research, advice, training, testing, certification and standards for both public and private sector organisations in the UK and abroad. 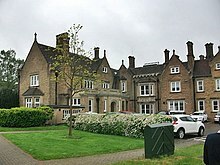 It has its headquarters in Garston, Hertfordshire, England, with regional sites in Glasgow, Swansea, the US, India, the Middle East and China. BRE is now funded with income from commissioned research, commercial programmes and by a number of digital tools for use in the construction sector. BRE's certification arm – BRE Global – is an independent, third-party certification body responsible for sustainability certification schemes such as BREEAM (for buildings and communities), CEEQUAL (for infrastructure), the Home Quality Mark (for housing) and LPCB certification (for fire and security products and services). BRE's training arm, the BRE Academy provides online and classroom courses on built environment related issues like sustainability, fire, resilience and building information modelling (BIM). BRE also carries out research and data generation in support of national and international standards and building codes, including the UK building regulations. It also develops its own standards for responsible sourcing (BES 6001), and ethical labour sourcing (BES 6002). BRE's digital tools include construction waste management tool SMARTWaste and construction health, safety and wellbeing tool YellowJacket. It also has UKAS accredited testing laboratories, and a publishing business in partnership with IHS Press called the BRE Bookshop. The Building Research Establishment is owned by the BRE Trust, a registered charity that works to support research and education in the built environment. All of the profits accrued by BRE are passed to the Trust and are used to fund new research and education programmes designed to meet the Trust's goal of promoting safety and sustainability. Over the last 20 years[when?] the BRE Trust has funded 117 PhDs on a total research programme of £15m, with other funding levered into the sector as a whole from research councils and European Union research sources. The BRE Trust also financially supports five university Centres of Excellence. One of the first Centres established was at the University of Edinburgh in 2004, a research and education programme on fire safety engineering. The other centres are in Strathclyde (energy utilisation), Bath (construction materials), Cardiff (sustainable engineering), and Brasilia (integrated and sustainable communities). BRE was founded in 1921 as the Building Research Board at East Acton as part of the British Civil Service, as an effort to improve the quality of housing in the United Kingdom. During the Second World War, it was involved in the confidential research and development of the bouncing bomb for use against the Möhne Dam in the Dambusters Raid of 1943 A small scale model of the dam used for testing can still be found at the Centre in Garston, Watford, today. BRE was a founding member in 1976 of BSRIA, the Building Services Research and Information Association and the UK Green Building Council (UKGBC) in 2007. Having subsumed a number of other government organisations over the years, including the former Fire Research Station, and the Princes Risborough Laboratory, it was given executive agency status in 1990, before being privatised by the Department for Environment, Transport and the Regions on 19 March 1997. From 1 January 2013, BRE took over the management of the UK and Ireland chapter of BuildingSMART. In August 2016, Constructing Excellence merged with BRE, with BRE undertaking to maintain the CE's brands and functions. ^ "Contacting BRE". BRE.co.uk. Building Research Establishment Ltd. Retrieved 18 May 2017. ^ "BRE Group Responsible sourcing". bregroup.com. Retrieved 31 March 2018. ^ "BRE Group: Ethical Sourcing". bre.co.uk. Retrieved 31 March 2018. ^ "BRE Group: Our history". Retrieved 28 May 2012. ^ "les.man.ac.uk/IPA97/papers/boden35.html". Archived from the original on 29 May 2005. ^ "www.stalbansmuseums.org.uk/Education/Explore-online/Chocks-Away-The-Story-of-Local-Aviation". Archived from the original on 20 November 2008. ^ "www.civilservice.gov.uk/management/statistics/changes/index.asp". Archived from the original on 3 February 2007. ^ "BuildingSmart deal will hasten BIM adoption". Construction Manager. 20 December 2012. Archived from the original on 4 October 2013. Retrieved 4 October 2013. ^ Walker, Andy (16 August 2016). "Constructing Excellence to merge with BRE". Infrastructure Intelligence. Retrieved 18 May 2017. F.M. Lea (1971). Science and building: a history of the Building Research Station. HMSO. B.J. Rendle (1976). Fifty years of timber research: a short history of the Forest Products Research Laboratory, Princes Risborough. HMSO. ISBN 978-0-11-670546-4. R.E.H. Read (1994). A short history of the Fire Research Station, Borehamwood. BRE. G.S.T. Armer; P.S.J. Buller (1996). "Some highlights of 75 years' structural engineering research at BRE". Structural Engineer. 74 (11): 194–196. ISSN 1466-5123. R. Courtney (1997). "Building Research Establishment – past, present and future". Building Research and Information. 25 (5): 285–291. doi:10.1080/096132197370264. ISSN 1466-4321. Wikimedia Commons has media related to Building Research Establishment. Charity Commission. BRE Trust, registered charity no. 1092193. This page was last edited on 11 March 2019, at 09:31 (UTC).